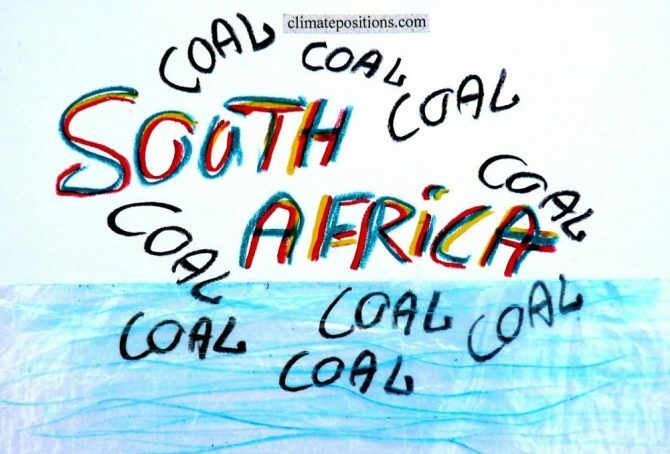 South Africa populates 0.7% of the planet’s people and emits 1.3% of the world’s CO2 from fossil fuels (without bunkers) and cement production. 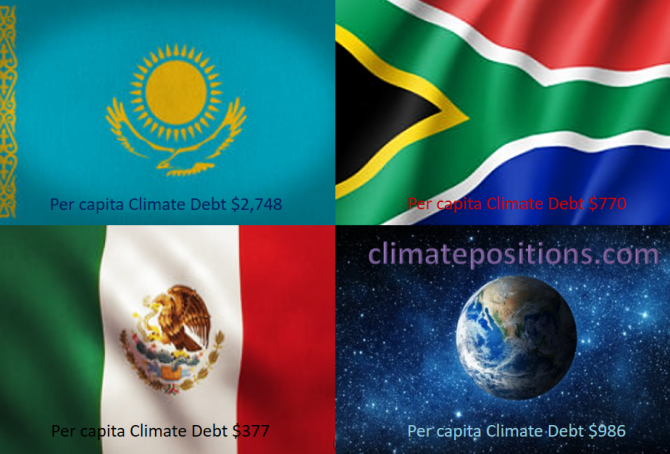 The Climate Debt of the 54 million South African’s amounts to $39 billion, or $720 per capita, and the ‘Ranking’ was 42nd among 148 countries by January 2016 – in 2010 the ranking was 45th. 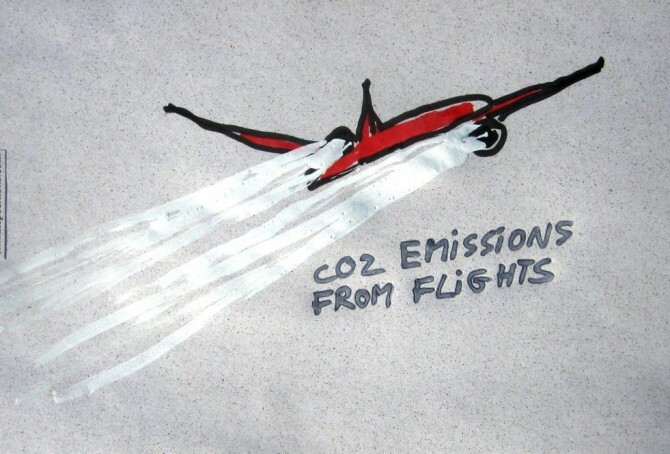 The first diagram shows South Africa’s per capita CO2 Emissions from fossil fuels (without bunker fuels) and cement production in decades in comparison with the world average. 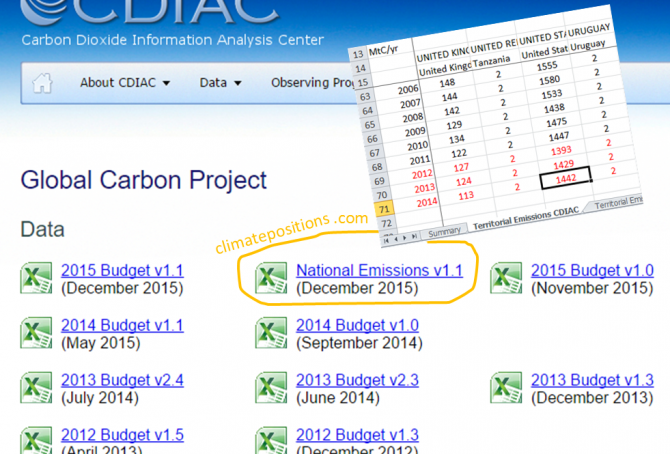 CO2 Emissions 2012-2014 are preliminary estimates. 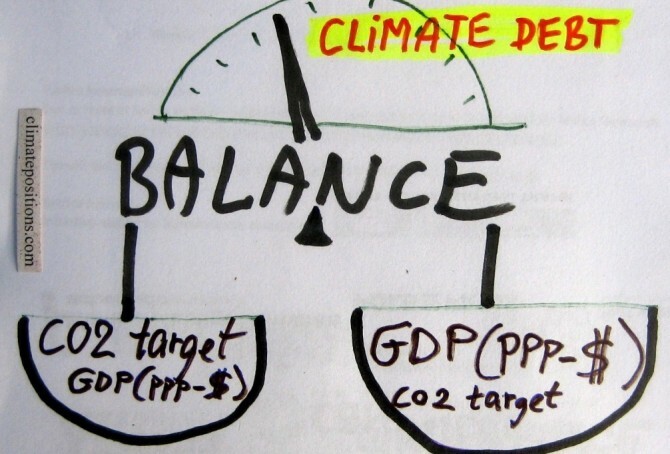 The green bars are the Contribution Free Level, determined by the level of CO2 Emissions in the 1990s and a number of continuously updated ‘Indicators’. 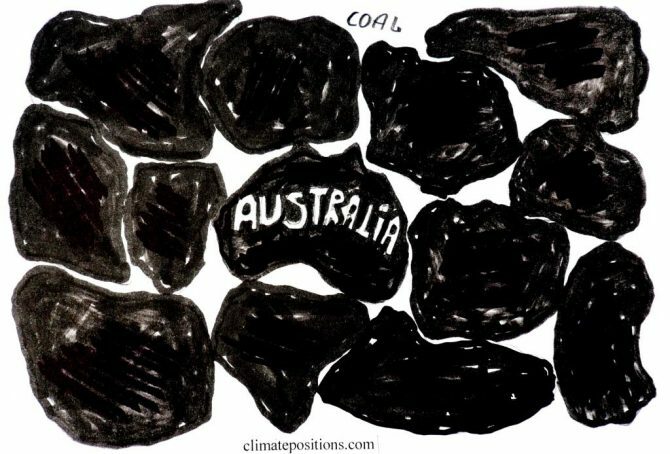 36 out of 44 African countries in ClimatePositions are Contribution Free and the total climate debt of the African continent is 1.1% of the global climate debt – the share of the global population and CO2 Emissions from fossil fuels is respectively around 13.8% and 3.7%. 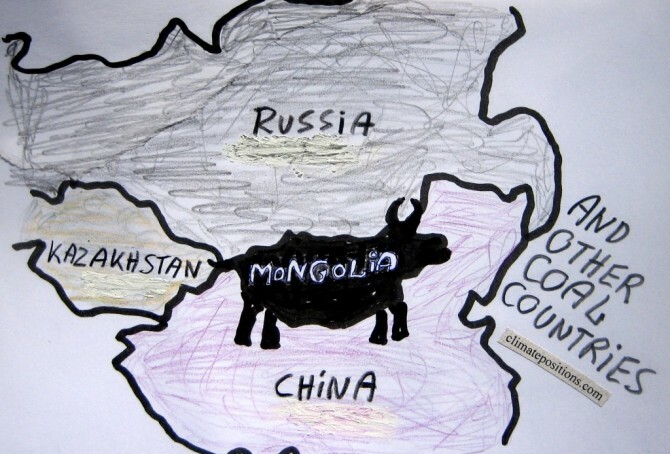 The eight countries ranked below stand out in Africa by having a climate debt. 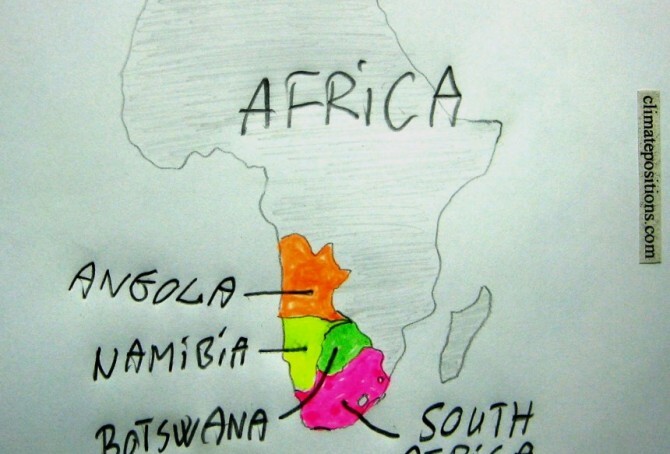 This article analyses the performance of South Africa, Botswana, Angola and Namibia. 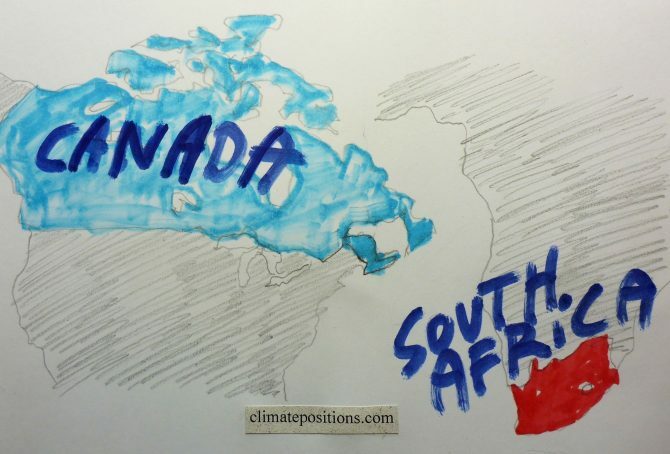 South Africa was the 38th worst performing country out of 145 in ClimatePositions 2010 while the neighboring Botswana was the 60th. 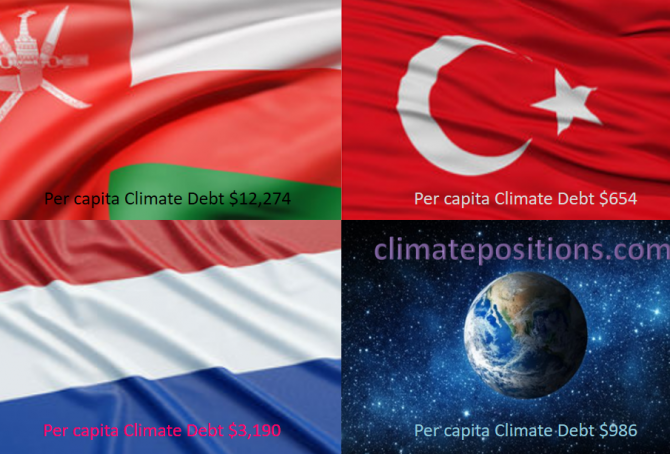 The Climate Contributions (climate debt) were respectively $448 and $69 per capita (with the latest updates the amounts have increased to $592 and $84 per capita). 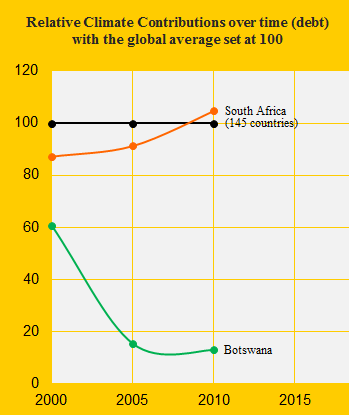 See the relative Contributions in 2000, 2005 and 2010 in the diagram with the global average set at 100. Below we highlight some of the national indicators in the calculations.